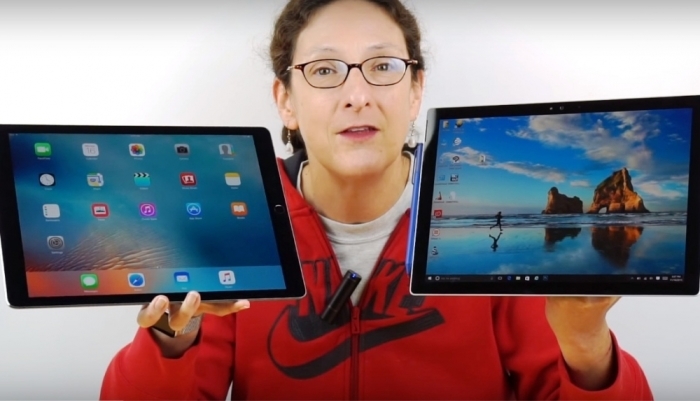 The Microsoft Surface Pro 4 and Apple iPad Pro are now being pitted against each other in the war of hybrid tablets, and consumers are now struggling to decide which device is worth buying. Consumers who are more inclined to draw, design, and sketch are advised to go for the iPad Pro, because it has a pencil with a rubberized tip. In terms of performance in the creativity department, the Apple hybrid tablet is better than the Microsoft Surface Pro 4, according to the International Business Times AU. The iPad Pro measures 305.7 mm x 220.6 mm x 6.9 mm and weighs 713 grams. It boasts of a multitouch screen with a resolution of 2048 x 2732 pixels. The device runs on the Apple A9X chipset and the iOS, and it and comes with 4 GB of RAM and 32 GB of storage expandable up to 128 GB, an 8-megapixel rear snapper, and a 1.2-megapixel front snapper, the report details. The Microsoft Surface Pro 4, on the other hand, has a sleek appearance with a 12.3-inch display that boasts of a 2736 x 1824 resolution. It runs on an Intel core M3 processor and comes with an 8-megapixel rear camera, 5-megapixel front camera, and 4 GB of RAM. Both devices have an optional keyboard, but Matt Weinberger of Business Insider said the Surface Pro 4's is handier. The iPad Pro's Smart Keyboard has no trackpad and the design is a bit cramped, the EconoTimes reports. It is worth noting that the iPad Pro can only support apps, unlike the Surface Pro 4 that can be a complete laptop replacement because of its Windows 10 OS. When it comes to handling computer tasks, the Apple hybrid tablet is a far cry from its Microsoft counterpart, Gary Krakow of The Street said. In conclusion, consumers have to determine first their purpose for buying a 2-in-1 gadget and their tech needs. The Microsoft Surface Pro 4 is more suited for individuals who do a lot of computer work, while the Apple iPad Pro is perfect for those who are into designing and sketching.